French-Swedish online wine dealer Caviste recently released new wines from Le Grappin in Burgundy. 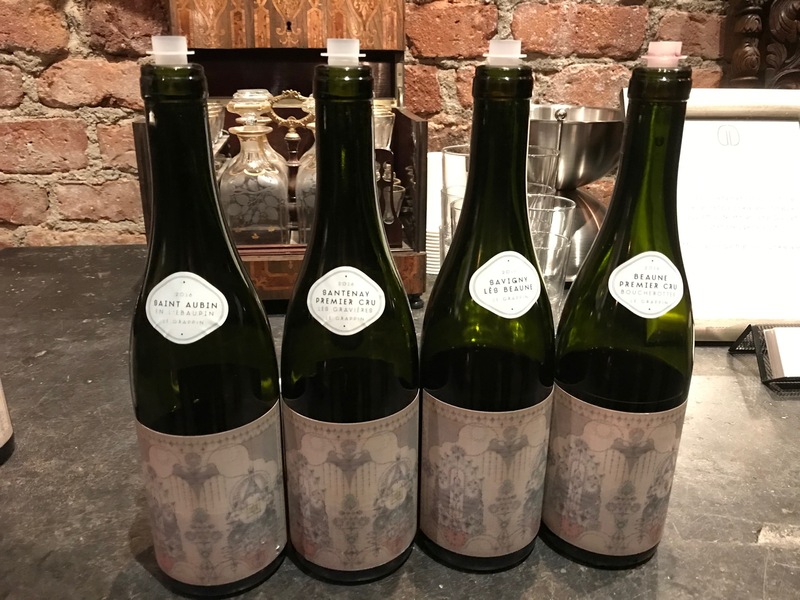 Le Grappin is run by an Australian by the name Andrew Nielsen, and I’ve blogged earlier about the corresponding release in 2015 (then the 2013 vintage) and in 2014 (then a mixture of the 2011 and 2012 vintages). This time around, the 2016 vintage wines were on tasting. As I’ve mentioned earlier, it is a good Burgundy vintage, with a pure and elegant character. In general, the wines are firm with high levels of acidity, which means that the red wines (at least those of higher class) are of a style suitable for extended cellaring, and that the white wines are fresh. My impression of the style of Le Grappins stil is that the wines are classical, or almost old-fashioned, in the original and very best meaning of that expression. In general, I get the impression that the white wines are produced in a bit more powerful and generous style than the reds, which tend to be firmer in style. The red wines are produced using a fair amount of stems, which tends to result in wines that call for more cellaring, and also are more long lived. In a vintage like 2016, these two characteristics enhance each other on the red side. Chardonnay, production in 2016 was three barrels. Nose with ripe apple and pear – freshly cut pear and apple including some fried apple, some chalky mineral notes, spice and oak, and a hint of nuts. The palate is dry and noticeably mineral-dominated, rather high acidity, apple, some spice notes, with a very mineral-dominated aftertaste. The wine is approachable now, but would benefit from some development, 88(+)/89(+) p.
The Saint-Aubin is lighter than the Santenay, but is more mineral-dominated. Despite this, there is a powerful and generous basic character which actually reminded me of Meursault, but not the most “buttery” versions. Instead, I thought of those that show a lot of mineral, in a nutty and powerful way. Chardonnay, production in 2016 was four barrels. Nose with ripe apple, mineral, spice notes, well integrated but rather prominent oak barrel notes. The palate is dry and medium bodied+ with ripe apple, yellow plum, good concentration of fruit, a lot of mineral, good acidity, and a long, mineral-dominated aftertaste. Approachble now, but would really benefit from cellaring, 90(+) p.
This wine is more concentrated and shows more fruit than the Saint-Aubin, i.e., the mineral note is not quite as dominating, although it is quite present. This is the larger wine of the two. This also made me think of Meursault, and this is the more “meursaulty” of the two. Pinot Noir from the climat Aux Fourneaux. Nose with cherries, ripe strawberries, hints of green stalky notes, gravelly and chalky mineral notes. The stalks contribute to a classical nose with some “retro feeling”, but the nose shows fine balance. The palate is medium-bodied with cherries, some cranberries or lingonberries with associated berry bitterness, rather good concentration of fruit, good acidity, some tannins, and light spice notes. Rather firm, but more due the acidity and the stalky notes than the tannins as such. Shows good substance and would benefit from cellaring, but is reasonably approachable now for those who enjoy firm burgundies, 88(+) p? Of the two red wines, the Savigny is the one that most clearly demonstrate how the vintage character and the producer style combine to result in a firm style. This time, I had a more difficult time to score the red wines, and this was the more difficult of the two. Nose with ripe strawberries, cherries, light flowery notes, hints of tar, hints of stalks. The palate is medium bodied(+) with ripe strawberries, cherries, some cranberries with associated bitterness, prominent chalky mineral note, well embedded tannins. The aftertaste is berry- and mineral-dominated but firm. This wine shows fine substance, but could benefit from cellaring, 89(+) p.
A rather firm wine, but more juicy than the Savigny, so while it is the “bigger wine” it is easier to drink now. Although it is a wine with more concentration, the berry notes are more red, i.e., less dark, in this wine. I notice that my impression of the 2012 and 2013 vintages was the same, so the regular state of affairs at Le Grappin is apparently that the Beaune Premier Cru is more red, generous and accessible as young, compared to the Savigny.